They're fun, colorful and a low-calorie way to satisfy your sweet tooth. But with sugar as its first ingredient, Kellogg's Fruit Loops are not the healthiest of breakfast cereals. Knowing the nutrition information for the sugary cereal can help you determine if it has a place in your healthy diet plan. One cup of Fruit Loops, which is 29 grams, contains 110 calories. Fruit Loops may be low in calories, but they're not that filling. People tend to eat the same weight in food each day regardless of calories, according to the British Nutrition Foundation. Foods with a higher weight per calorie are more filling. 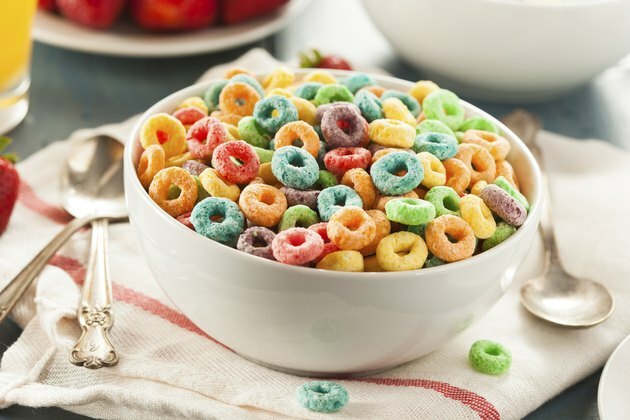 Fruit Loops have 3.8 calories per grams and are considered a medium energy-dense food, which means that it's not as filling as lower energy-dense foods such as fruits, vegetables, and it may not make the healthiest choice when trying to lose weight. Most of the calories in Fruit Loops comes from its carbohydrate content. One cup of the cereal contains 26 grams of carbs, 3 grams of fiber and 12 grams of sugar. While the cereal is a source of whole grains and fiber, it is also a significant source of added sugar. On average, Americans get 16 percent of their daily calories from foods with added sugar, according to the U.S. Department of Agriculture. Limiting your intake of these types of food might help reduce your calorie intake without compromising the nutritional quality of your diet. Fruit Loops contain a small amount of protein and fat. A 1-cup serving contains 1 gram of protein, 1 gram of total fat and 0.5 grams of saturated fat. As a non-meat food, you might find it surprising that Fruit Loops is a source of saturated fat. But Fruit Loops contain partially hydrogenated oils and may also contain coconut oil, both sources of saturated fat. High intakes of saturated fat are associated with elevated cholesterol levels and heart disease. The American Heart Association recommends that you limit your intake of saturated fat to less than 7 percent of calories, or no more than 16 grams on a 2,000-calorie diet. One cup of Fruit Loops contains 135 milligrams of sodium, meeting 6 percent of the daily value. Overall, the cereal is a fairly low-sodium breakfast option. Getting too much sodium in your diet increases your risk of developing high-blood pressure, and the U.S. Dietary Guidelines for Americans recommend that you limit your intake to no more than 2,300 milligrams a day. Fruit Loops are a good source of a number of vitamins and minerals, including iron, folate and vitamin B12, because it is fortified. Some segments of the population, namely pregnant women, are at risk of not getting enough iron or folate in their diet, and foods like Fruit Loops can help them meet their needs. Both iron and folate are necessary for blood building, and women of child-bearing age need adequate intakes of folate to prevent birth defects. Vitamin B12 is primarily found in animal foods, and Fruit Loops may help people who do not eat meat get their vitamin B12. British Nutrition Foundaton: What Is Energy Density?